S. H. COULSON, A.I.R.I., A.N.C.R.T. The publication of Pocket Book EL provided a considerable amount of data on the deployment of British industrial locomotives as at 1st November 1968. Not surprisingly, the heavy industries are the major users, and this is most appropriate since the railway owes its existence to the colliery industrial railways. The general pattern of usage is similar in England, Scotland and Wales (except in the quarrying domain where closures have occurred recently) but in Ireland where there is little in the way of heavy industry things are different. 95 per cent of Irish industrial locomotives are narrow gauge, but in England, Scotland and Wales the percentage is much lower - 28, 26 and 30 respectively. In Ireland there is one industrial locomotive for each 90.4 square miles, in Scotland 1/54.8, in Wales 1/14.6, and in England 1/10.9. Wales has more industrial locomotives per head of population (1 per 4,840) than England (1/9,400), Scotland (1/9,500) or Ireland (1/11,980). Tables 1 to 3 are self-explanatory. The major industries have been grouped into eighteen sections in the way suggested in the February 1969 issue of Industrial Archaeology. Before commenting on the special characteristics of the employment of industrial locomotives, here are a few more statistics. 63 per cent are standard gauge (SG), 31 per cent are steam, and the average number of locomotives per site (in whole numbers) is 3. SG 80%, Steam 63%, Locos per site 3. The coal industry is a declining industry and consequently the locomotive stock is not particularly modern. In addition there is a marked incentive to use coal as fuel, hence steam locomotives. SG 96%, Steam 16%, Locos per site 7. Quite a prosperous industry with a need to modernise its transport systems since 24 hours a day and 7 days a week is normal practice. Fleets of standard diesels now in general use, with the highest number of locos per site. Electric locos used at cokeovens. Narrow gauge systems normally not used due to the need to transfer rolling stock from the main lines. SG 35%, Steam 57%, Locos per site 5. High proportion of narrow gauge necessary for track flexibility. Often old standard gauge locos used. Little incentive to modernise rail systems due to more widespread use of dump trucks or conveyor systems. On the narrow gauge, battery electric locos are widely used underground in fluorspar, copper, iron and lead mines. SG 70%, Steam 29%, Locos per site 2. . Many undertakings now closing rail systems, e.g. gasworks with the trend away from coal as a raw material, whilst in power station systems the industrial locomotives are being displaced by main line locomotives hauling "Merry-go-round" trains. Quite a high proportion of standard gauge electric locomotives used, the overhead wire type at cokeovens with overhead wire and battery types at power stations. In addition quite a large number of standard gauge fireless steam locomotives are used. SG 39%, Steam 20%, Locos per site3. Large proportion of narrow gauge lines for flexibility. Raw materials conveyed to the kilns by rail, but normally the despatch of the finished products is by road. Internal combustion locomotives have been popular for a long time. A peculiarity is the use of overhead wire electric locomotives on both standard and narrow gauges. A considerable number of cable hauled rail systems are in use, but the replacement of rail systems by conveyors and dump trucks is proceeding rapidly. SG 0.25%, Steam nil, Locos per site 6. A narrow gauge speciality since light, easily moved track and light locomotives are essential, hence the use of small narrow gauge diesels. Competition from conveyor and dump truck systems negligible due to the difficult nature of the terrain, hence this will be a rail served industry for some time to come. Most concerns, even in England, have large locomotive stocks, several home built. SG 64%, Steam 11%, Locos per site 5. Money appears to have been available for modernisation of loco stocks, hence small proportion of steam locomotives. Not many narrow gauge locations, but where they do exist there are a large number of locomotives per site. Of the narrow gauge locomotives there is quite a high proportion of battery electric locomotives. SG 88%, Steam 10%, Locos per site 3. Considerable interchange of rolling stock with the main lines, hence little narrow gauge. Most industries have fire hazards and therefore there was a tendency to use fireless locomotives prior to dieselisation. Electric locomotives used in coke ovens. Competition from modern cable systems at oil terminals, "Merry-go-round" trains and pipelines. SG 86%, Steam 10%, Locos per site 2. Interchange of traffic with main lines, therefore little narrow gauge. Low proportion of steam, perhaps because locomotives only used occasionally. Many concerns have just one locomotive. Competition here from shunting tractors. SG 99%, Steam 20%, Locos per site 5. Standard gauge essential to permit interworking of rolling stock. Now being modernised with diesels to give greater availability. Usually large fleets of locomotives. May suffer from "containerisation" and then "Merry-go-round" trains competition. SG 96%, Steam 18%, Locos per site 2. Now mainly standard gauge, there used to be narrow gauge lines in the shipbuilding industry. Crane tanks and vertical boilered locomotives used to be quite common in shipyards. Rapidly diminishing use of rail systems. SG 24%, Steam 11%, Locos per site 3. Narrow gauge necessary for versatility. Many narrow gauge battery electric locomotives used in tunnel work. The rail aspect of contracting is just a shadow of what it was. Being replaced by the more suitable digger/loader/dumper systems. SG 86%, Steam 30%, Locos per site 2. Standard gauge was necessary for main line connections. Fireless locomotives have been quite widely used, but for hygienic purposes this time. Many systems closing due to the increasing use of road delivery services. SG 88%, Steam 18%, Locos per site 2. Standard gauge connections with British Rail essential. Modern diesels readily available! SG 82%, Steam 34%, Locos per site 2. Main line connections necessary. Due to fire hazards fireless locomotives have been used. Many concerns have only one locomotive, but there is now quite a rapid turn over to road transport. SG 80%, Steam 52%, Locos per site 2. Steam locos mainly used in synthetic fibre industries, but these rail systems are being closed. SG 100%, Steam 50%, Locos per site 2. Used to be many more but the accent is now on rubber tyred transport! SG 0%, Steam nil, Locos per site 1. One solitary example, with a home made locomotive. Likely to be used for some time since the manager is a railway enthusiast, though the rail system can be justified. Ray Fox seeks information on the photograph from his collection reproduced above. 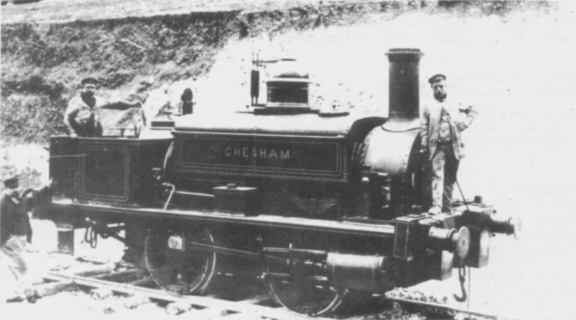 Whilst we are unable to identify the builder, the name CHESHAM suggests this locomotive might have been used by J.T. Firbank in 1889 on the construction of the Chesham branch, Metropolitan Railway. Can any reader help?